Don’t look now… the leaves are changing. If you look really carefully, the light is getting different, too. There are still plenty of beautiful Northwest days to enjoy, but it won’t be long before we are back to that familiar special effect that we are oh-so-well known for out here. Don’t miss one ripe tomato, peach, or plum. 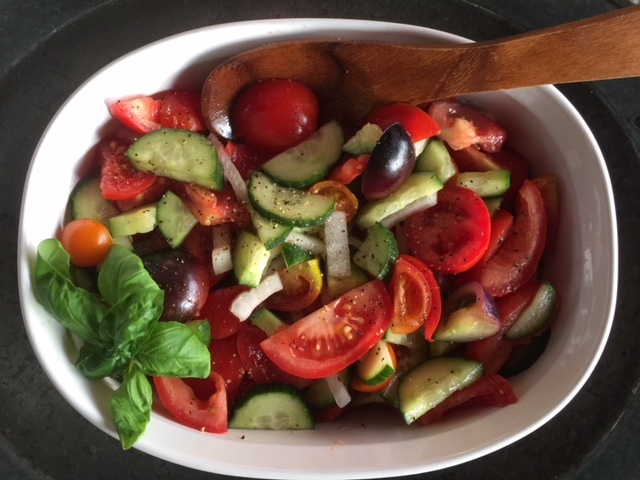 This tomato/cucumber salad is a must-do every summer – several times, at least. I am reposting it because it’s easy to make and a great way to use all those tomatoes your garden is suddenly churning out. It goes great with whatever else you might be having for dinner and you can make it ahead. The longer it sits, the better it gets and it will hold up for several days, if you can keep everyone from devouring it. This salad loves bread. The juice at the bottom of the bowl is just waiting to be sponged up with the soft part of something warm and crusty. Feel free to leave the basil out, use a splash of white vinegar, or add some balsamic vinegar. Add as much, or as little, olive oil as you like. Serve in small bowls and spoon extra vinaigrette into each portion. Summer is just about to wrap, so enjoy it while you can. You’ll be drinking a pumpkin spice latte before you know it. Slice tomatoes lengthwise into wedges. Peel cucumber, halve lengthwise and slice thin. Slice onion fairly thin. Combine all in medium mixing bowl. Pour red wine vinegar over, enough so that you have about 1/2 inch of liquid at bottom of bowl. Add several pinches of sea salt and freshly ground black pepper. Drizzle with olive oil. Add sliced fresh basil, or substitute dried. Stir to combine. Let sit about 5 minutes, then stir to combine again, tasting and adjusting seasonings as needed.